With todays satellite and freeview TV we are overwhelmed with TV channels, but when I was young we considered ourselves lucky to have three! When I was growing up we had BBC1, BBC2 and ITV, and that was it. Channel 4 arrived in 1982 bring us to a whopping four channels. In those days the lack of real competition between the channels meant that everyone really looked forward to the Christmas TV offerings. All year we had sat through repeats of TV series and films knowing that for two magical weeks at the end of December we would be treated to a cornucopia of things we had never seen before. Christmas specials of comedy shows were always popular (e.g. Morecambe and Wise, Only Fools and Horses etc. ), soaps got shown in the middle of the afternoon and the evening (much to my personal annoyance it must be said) and a wide variety of films got their TV premiere. 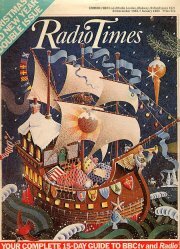 In order to make sense of all this it was important to get hold of the special two week Christmas editions of both the Radio Times (for the BBC channels) and the TV Times (for ITV) as the TV listings were jealously guards by the TV stations in those days. At least an hour was spent going through the magazine identifying which programmes you wanted to watch, and which you wanted to videotape to keep and watch later. Of course, you knew you should have written this all down, but you never did, and it was guaranteed that you would manage to miss at least one programme over the period. This entry is filed under Books and Magazines	and was posted on December 19th, 2007. You can follow any responses to this entry through the RSS 2.0 feed. You can leave a response, or trackback from your own site. 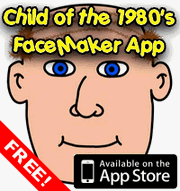 Hi there I, like you, have a huge amount of sentimentality stored up about the 80’s. One of my favourite things was spending time with my large group of cousins during the summer holidays, and in the morning watching the summer kids tv programmes. wonder if you know where I can find copies of the radio times from those summer holidays in the early and mid Eighties? Love your site and have forwarded it to other who I know will appreciate it. Cheers, Steve. As to where you can get hold of old copies of the Radio and TV Times, I really don’t know, but it would be great to see some of those old magazines again.